The National Library of Scotland has records relating to the Grand Lodge of the Order. Extrapolating from these Rules, Reports of Annual General Meetings, and Balance Sheets, some of which are both numbered and dated, the Order originated in 1878-9. However, evidence from the PO Directory and archival holdings can be used to outline a fuller history. More than 100 gardener lodges are known to have attended a meeting in Edinburgh during 1859 to discuss the organisation of the existing Grand Lodge of the Ancient Order. It would be reasonable to suppose that irreconcilable differences caused a schism in that year, creating the bodies known first as the Ancient Order of Free Gardeners (Western Grand Lodge) and the Ancient Order of Free Gardeners (located in Edinburgh and Leith). An Eastern and Western Grand Lodge appear from this date in several sources. A minute book of the latter dated 1859-84 supports the above inference. It is in Glasgow City Archives. In the Edinburgh PO Directory for 1885/6 an entry for the Ancient Order of Free Gardeners (Western) appears with one affiliated lodge, Archibald Stewart Leith. 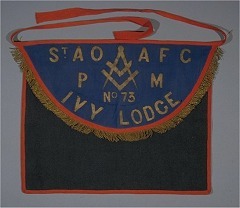 Later, the same lodge appears with others under the St Andrew Order and the Western attribution has disappeared. In the late 1890s the St Andrews Order appears with the additional information 'affiliated to the National United Order of Free Gardeners (England)', which persists into the 1900s. The registered office of the St Andrew Order was in McFarlane Street, Glasgow, where it remained. In the late 1890s the East of Scotland District (No2) had settled in offices at 5 Hope Park Terrace, Edinburgh, where they remained until after 1974/5.